The Full Moon coming in. Here’s my Full Moon post from Patheos Pagan. In this post I want to talk about how it feels because I feel it, this Capricorn Full Moon, and on my Facebook I posted that I consider myself EXPERT LEVEL in feelings but even I feel this one intensely, incoming. And it’s about to thunderstorm here. Perfect! Rumbly grumbly thunder and leaves and branches blowing and it looks great! Grateful to be inside though listening to my Spotify and writing to you. Lightening flashes and the wind blows. Good thing I’m stocked up on candles and matches. Is that hail? It’s hailing. Does that cover it? Maybe. I went to a grocery store this morning and anyone who knows me knows that grocery shopping is my favorite thing in the world, on par with my favorite coffee shop and I still felt anxiety, sadness, and a touch of angst but oh the wonders the wonders! The store did assuage my anxiety and sadness a bit. It wasn’t a Whole Foods (we don’t have one yet) but it reminded me enough of my favorite NYC Whole Foods, in a good way, and what a perfect thing to do for a FULL MOON IN CAPRICORN opposing a Cancer Sun (which will be in my Solar Return by the way!) with Pluto and Jupiter involved. Food. Hunger. Safety and security. Nourishment, nurturing. Love. Love. Love. Love. Organic lettuce. Love. Love. Love. Cheaper Coconut Milk than Publix and a better brand. Love. Love. Love. Please pass the cacao nibs. Everything you feel, today and tomorrow, will feel so very very very big. It may feel like life and death. It may feel this way. I recommend a boat. I recommend a raft. Sail away on it. Out into the middle of the ocean, out into the middle of the sea, the big big sea. What music are you listening to out there? Or nothing at all. It’s quiet on the water but for the water. Wanna know what my raft is? This. You. Us. Talking to you, being with you. And I may bake cookies again today (low carb, ketogenic cookies – one of these days I may start doing grocery store hauls on YouTube unless you beg me not to). What’s your raft? Where is it? Is it strong enough to hold you? Do you want me to hold you? I can do that. I can carry you. I’ll draw a card for you, and us, and OH by the way – ALL DAY TODAY I am doing Mini Moon TAROT readings $25 for 15 minutes (no overtime) for Full Moon advice if you are struggling. Today only. Facebook Messenger readings. Or Gmail Gchat. The thunder sounds like a lion’s roar I kid you not. 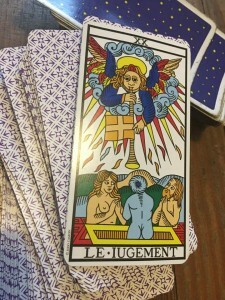 I drew the Judgement card. Revelation. Enlightenment. New understanding. (Interps from Yoav Ben-Dov). Very Full Moon, eh? What’s coming through for you? What are you figuring out? Do you know what’s in store? Healing. Slowly. Over time. Naturally. Or in a flash, like that lightening just now. The Judgement card to me suggests this Uranian flash healing ZAP you are whole! And maybe a little of both. Wow MP. On point per usual. Going to get real here and I assume after many moons reading you this will be tolerated; perhaps even appreciated. Twin sister and I have Cap rising. She had in vitro and lost the baby four months in. She actually had to get an abortion to remove the fetus because her body didn’t pass it naturally. After the miscarriage her body went into alarm mode. She has been sick with weight loss, full body sores. Seen many doctors all of whom can’t figure out what is wrong. She is supposedly healthy but everyday is worse and she has had to quit her job because she can’t work at her sales job covered in lesions. She doesn’t leave the house. Has a appointment at the Mayo Clinic in a couple of weeks and is hoping for a miracle. 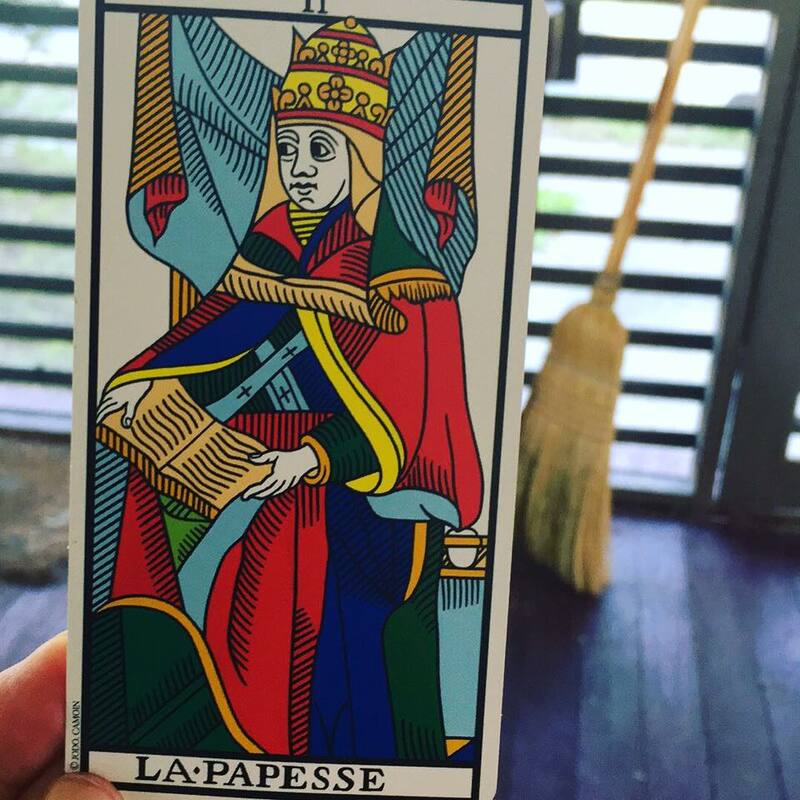 She does Tarot. 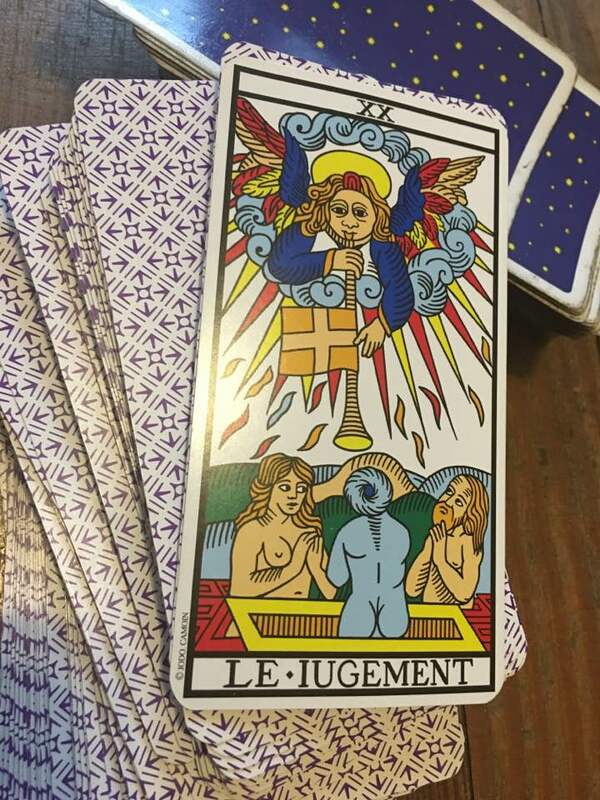 And her outcome card was Judgement the last few times. That gives her hope. Stressed out about my sister and my work partner retiring (my mother figure here on earth school since my biological mom passed years ago) I developed a muscle problem that makes it hard to eat and speak. I am undergoing physical therapy and soon a head doctor, but this has been an incredibly dark time. I think us Cap risings sign up for hard lessons.